McKesson Confiderm 3.5C Powder Free Nitrile Textured Fingertips Exam Gloves feature beaded cuff for comfortable wearing. They also feature dexterity and tactile sensitivity for durable barrier protection. 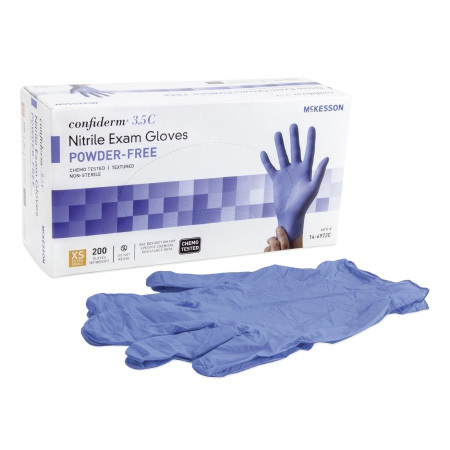 The Confiderm 3.5C gloves are ambidextrous, non-sterile, latex free and for single use only. These blue colored gloves are chemo tested. The fingertip thickness is 0.08 mm (3.15 mil) and length 9.6 inches. These exam gloves are made with high-quality materials and are designed to be used in situations where ultimate protection is essential.